Cork Chamber and Republic of Work once again join forces to bring you another event in the Innovation series. 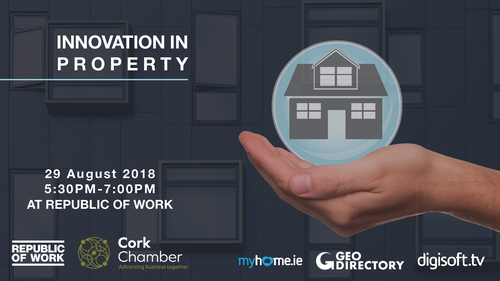 This event, taking place on Wednesday 29th August will focus on exploring Innovation in Property, looking closely at the property industry and the innovative ideas and technologies improving the customer experience. Diarmuid Lynch, Flagship Manager at Bank of Ireland. The panel will discuss some of the latest innovations within the property industry as well as their own personal experiences and the changes within the commercial and residential property industry. Networking from 5:30PM with panel discussion commencing at 6:00PM sharp.